^ "Egypt's army chief Abdel Fattah al-Sisi receives a promotion ahead of likely presidency bid". Australian Broadcasting corporation. 28 January 2014. Retrieved 4 May 2015. ^ Mertz, Ed (25 June 2012). "Egyptian President-Elect Has Ties To USC, CSUN". KNX (CBS News). Retrieved 27 July 2013. ^ "Profile: Egypt armed forces chief Abdul Fattah al-Sisi". BBC News. 3 July 2013. Retrieved 5 July 2013. 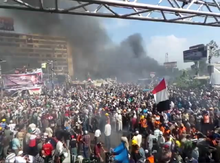 ^ "Tea and tear gas in Tahrir Square". Amnesty International. 19 November 2012. ^ "Egypt: Morsy Decree Undermines Rule of Law". Human Rights Watch. 26 November 2012. 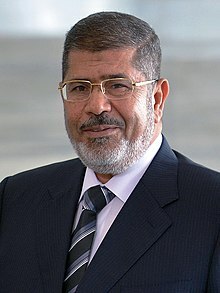 ^ a b c d "Morsi role at Syria rally seen as tipping point for Egypt army". The Irish Times. 2 July 2013. Retrieved 3 July 2013. ^ "Egypt seen to give nod toward jihadis on Syria". Salon. 17 June 2013. Retrieved 3 July 2013. ^ Kirkpatrick, David D. (15 January 2013). "Morsi's Slurs Against Jews Stir Concern". The New York Times. ^ World Digest (11 October 2018). "Police detain former president's youngest son". Washington Post.